Frozen custard caused a sensation at the 1933 World’s Fair in Chicago. Although similar to ice cream, custard contains more cream and less milk, along with egg yolk and butterfat, which gives it a smoother texture and richer taste than ice cream. Following the fair, Wisconsinites brought it north, opening custard stands in the greater Milwaukee area, and eventually making it the unofficial dessert for the dairy state of Wisconsin. In the city of Milwaukee there are four landmark custard stands. Gilles, located at 76th Street and Bluemound Road, has served the Milwaukee community since 1938. Its south side rival, Leon’s Frozen Custard, is located at 27th Street and Oklahoma Avenue. 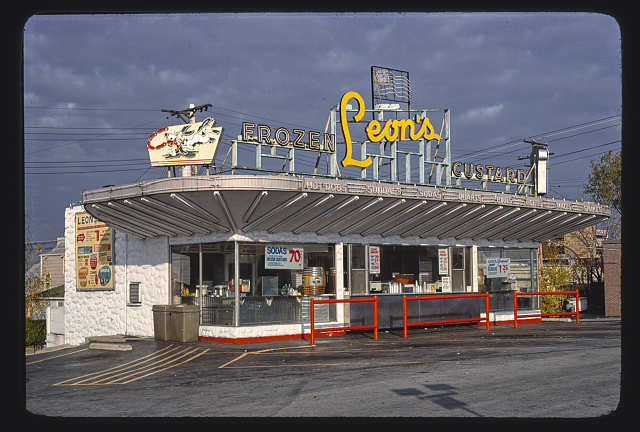 Leon’s opened its doors on May 1, 1942, and remains family-owned and operated. Kopp’s Frozen Custard, whose headquarters is now at 76th Street and Layton Avenue, was founded in 1950 at 60th and Appleton and has opened two additional locations outside Milwaukee. Finally, Kitt’s Frozen Custard at 70th and Capitol Drive has served north side residents since 1950. While there are fewer custard stands outside Milwaukee, there are several suburban options that locals continue to visit: Oscar’s in West Allis, Pop’s Custard in Menomonee Falls, the Kiltie Drive-In in Oconomowoc, and Hefner’s Custard in Cedarburg, all of which feature a classic American menu of custard, hamburgers, hot dogs, and an assortment of fried foods. ^ Nancy Bagget, The All-American Dessert Book (New York: Houghton Mifflin Company, 2005), 284-287. ^ Harva Hachten and Terese Allen, The Flavor of Wisconsin: An Informal History of Food and Eating in the Badger State, 2nd ed. (Madison, WI: State Historical Society of Wisconsin, 2009), 151. ^ Gilles Frozen Custard, last accessed October 24, 2016. ^ The World Famous Leon’s, Home of the World’s Finest Frozen Custard, last accessed October 24, 2016. ^ Kopp’s Frozen Custard, last accessed October 24, 2016. ^ Kitt’s Frozen Custard on Capitol Drive, Facebook, last accessed October 24, 2016. ^ Frozen Custard Guide, onmilwaukee.com, last updated August 8, 2016; last accessed October 24, 2016. Bagget, Nancy. The All-American Dessert Book. New York: Houghton Mifflin Company, 2005. Hachten, Harva, and Terese Allen. The Flavor of Wisconsin: An Informal History of Food and Eating in the Badger State. 2nd ed. Madison, WI: State Historical Society of Wisconsin, 2009. McCann, Kathleen, and Robert Tanzilo. Milwaukee Frozen Custard. n.p. : The History Press, 2016.